Side-swept bangs look best on longer hair. For the seriously cash-strapped, cutting your own hair may seem like a great way to save some dough. Bangs can look like a simple starter project, but anyone who has tried an at-home hair cut knows it can quickly turn into a hack job. If you’re frozen from the fear that your bangs will look like a beauty school experiment gone pathetically wrong, take a deep breath. By following a few professional tips and taking your time, your fringe will blend seamlessly into your longer locks. Brush your hair out well to remove all tangles and knots. Stand in front of a well-lit mirror and turn sideways. Turn your head toward the mirror just far enough that you can see your reflection. Place a comb flat on the top of your head. Note where the front portion of your head begins to slope down, causing a gap with the comb. The beginning of the slope is the top of where your bangs will start. Place the tip of the comb at the point where your bangs will start and drag the comb down your scalp towards the center of your right eye. Pull the hair that falls to the right of where you land away from your face, and clip it up with a hair clip. 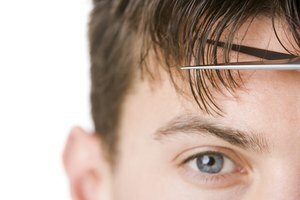 Place the tip of the comb back at the top point and drag the comb down your scalp towards the center of your left eye. Pull the hair that falls to the left of the point where you land away from your face and clip it back and out of the way. You should now have a triangle shape on the front of your head -- this outlines the bang area. Pull the rest of your hair into a hair elastic or a clip to keep it out of the way, leaving the hair that will be cut to hang straight down in front of your face. Comb this hair. Decide on which side of your head you want the bangs to lay, and comb your bangs over to the opposite side. Hold the hair near the roots so that it runs flat between the pointer and index finger of your non-dominant hand. Decide how short you want your bangs to be. 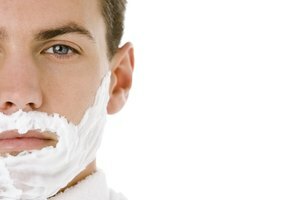 For those with longer hair, it's best to feather the bangs upward, starting near the jaw line and stopping near the eye. Slide your fingers down to the desired length. Turn hair-cutting shears on the diagonal toward your ear and cut diagonally upward from the inner side of the section of hair -- running the shears next to your fingers -- until you reach the desired end of the bangs. Take your time, and be careful not to cut your fingers. Gather the bangs back up, still on the opposite side of your head. Turn the point of the shears vertically so that they point up towards the ends of your bangs. Cut your bangs all the way across using short snips to prevent a blunt appearance. Comb your bangs over to the proper side of your head. If desired, spray the bangs with a light layer of hairspray to hold them in place. For piecey-looking bangs, apply a tiny dab of hair paste to your fingertips and work the paste through small sections of the bangs to separate them. 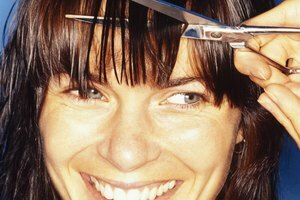 Don’t cut bangs when they are wet, or they may end up being too short. Hair shrinks as it dries, and cutting hair while it is wet makes it hard to determine what the final length will be. Johnson, Kimberly. "Step-by-Step Directions to Cut Bangs on a Long-Haired Person." Synonym, https://classroom.synonym.com/stepbystep-directions-cut-bangs-longhaired-person-15562.html. Accessed 23 April 2019.